I've always loved Cremone bolt hardware, it's the long vertical hardware that you often see on a set of French Doors. I think it adds such a beautiful detail to any doors (normally seen on a pair of doors). I've always envisioned this type of hardware on my double back doors, the black pair in the kitchen above. I think it would be a perfect finishing touch to these doors. I'll start looking for authentic vintage Cremone bolt hardware, but if I can't find what I'm looking for, I know it is available to buy 'new' from some suppliers who make vintage hardware. 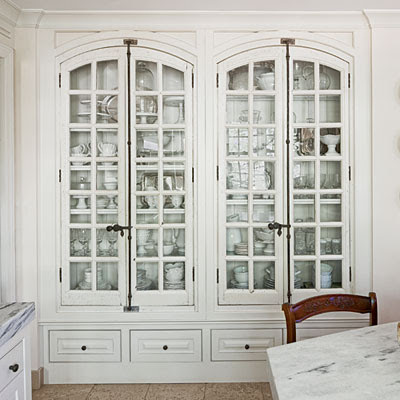 Here are more images of doors with Cremone bolts in my inspiration file. It also can be used to jazz up any interior cabinets, here is the hardware shown on cabinet doors, love how it looks!